The Cohiba Esplendido is one of Cohiba’s flagships, a rich and creamy Julieta No.2, of 47 ring gauge, 7" (178mm) long and comes in a box of 25 cigars. Originally launched in 1989, it became so popular in the beginning of the 2000’s to the point that it was over produced which caused a decline of quality. This issue has been resolved since, and the Esplendido has recovered its position at the top of Cuban cigars and even in the world, as it was voted among the Top 25 Cigars of 2014 by Cigar Aficionado. In short, the Esplendido is one of the most delightful cigars, which doesn't have any flaws. It is a bold smoke, yet with lots of creamy flavors. A top notch cigar. A wonderful Cohiba and one of the best Cuban cigar on the market. •	Rich Cuban flavors of wood, tobacco and nuts. An exclusive Cuban cigar that every aficionado should have in his humidor. 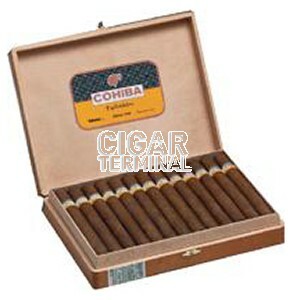 Do not be deceived by the light tan wrapper, its medium brown color does not mean the cigar is mild in strength. The wrapper has a slightly oily sheen, very few veins and a beautifully applied triple cap, like every handmade Cuban cigar. The look of the cigar is impeccable; only the best leafs from the Vuelta Abajo region are used. Before lighting up the cigar, some nice touches of sweetness comes out of it, some honey, some melted sugar taste, even some notes of graham cracker. Coupled with these amazing sweet notes, some undertones of cedar are also present, alongside with some strong earthiness and some leather. Slight touches of spices are also there, with some faint grassy notes. After punching the cigar, the draw was perfect, with just the right amount of resistance. It slightly gets a bit tighter as the cigar goes on, but it remains much appreciated. The burn isn’t always straight, but it always self-corrects; and the ashes build up for about two inches before falling off. Each draw produces a generous amount of smoke, and another welcomed aspect of the Cohiba Esplendido is that it never goes out while smoking. In the first third, the cigar greets you with ample flavors of wood; the cigar is very smooth and creamy, medium bodied for now. There are also lots of spices, mostly of red pepper and white pepper, but the spicy profile declines through the initial third. Alongside generous amount of earthy flavors are gaining predominance and the Esplendido is showing some nice complexity: some floral notes, cocoa hints, leather and some sweetness of honey are also appearing. Overall, the cigar remains very smooth and creamy; the balance of taste and flavors is very well maintained. There are even hints of nuts and some dry spices on the tongue. This is an exquisite cigar, and starts now to reveal its full potential. In the second third, the Esplendido reveals its true character with an increase in strength, from light to medium intensity, and an added complexity. Some more creaminess is coming to the forefront, of French vanilla, of caramelized toffee and as well as some good amount of nuts. Hazelnut is mixing up with some notes of cocoa, creating an incredible sort of Nutella flavor. This flavor goes on throughout the whole cigar and it is exceptional. Among the other noticeable flavors, we also detect some more floral scents, cedar, and hay, soon leaving space to more earthy flavors. There are also some hints of leather and of red pepper. In the last third, the Cohiba Esplendido reveals a marvelous finish. The cigar gets even sweeter and creamier thanks to a wonderful touch of French vanilla. Lots of aromas of cocoa and chocolate mixed with rich spicy flavors that keep you on your toes. There are also hints of soil and of earth that are added to the nice mix of flavors. Overall, this third alternates between a medium and strong bodied cigar. In summary, the Esplendido is a luxury cigar, very expensive indeed, which ages very well, 4-5 years later, it reveals its full potential. Even right out the box, the flavors are exceptionally rich and smooth. The cigar is never too harsh yet remains a powerful smoke to enjoy in the afternoon or after the dinner along with some sweet wine or liquor. Below the Sir Winston, the Esplendido comes just after if we would have to rate the Julietta II. If the price of the Esplendido is rather serious don't mess with this cigar ! To conclude, the liga is very serious and not so easy.